I think if you ask anyone living a low carb lifestyle what food they miss the most, I bet they will say pizza. 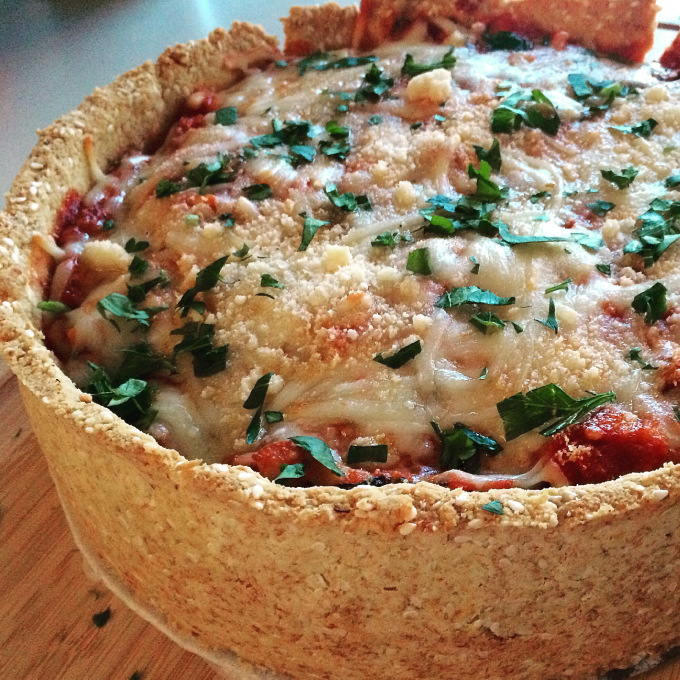 This pizza pie is a low carb version of a deep dish pizza. The crust is crunchy and you can fill it with all your favourite pizza topping. I like my pizzas spicy with pepperoni, mushrooms, and onions, so that is what I did here. I added a whole container of spinach to get some greens in, but a side salad would be the perfect accompaniment to this hearty dish. Mix all the dough ingredients in a bowl until the dough turns into a ball. Line the bottom of a 8 inch spring form pan with parchment paper and grease the entire pan. Spread the dough on the bottom and up along the sides with your hands. Prick the dough with a fork to prevent air bubbles while it bakes. Meanwhile, remove the sausages from its casing and put it in a large frying pan on medium heat. Add the onion, garlic, and pepper. Once softened, add the spinach a handful at a time. Once all the spinach has cooked put the mixture into a large bowl. Add the mushrooms, chicken, and dried oregano to the same frying pan. Once cooked add to bowl. Add to the bowl the crushed tomatoes and tomato paste. Mix well. Add the mozzarella and soppressata. Mix well. Once crust is done, take it out of the oven and put the pizza mixture into the pan. Top with mozzarella and parmesan. Sprinkle with fresh parsley for garnish. You can put anything you like in this pie. One thing to note is that the veggies need to be cooked. If they are raw, they will cook in the oven and release their juices and make the crust soggy. I didn’t add salt or pepper to this as I found the meats and cheeses gave the dish enough seasoning. As well, I found the fat from the sausage was enough for frying all the veggies. If needed, you can always add a bit of olive oil.